Energy conservation is an important factor here at Lee Manufacturing, as we are always looking for new ways to do more with less. This past fall we started from the top (literally), as we applied 40,000sf of additional ridged insulation to our roof when we installed a new rubberized roof covering about half the plant. 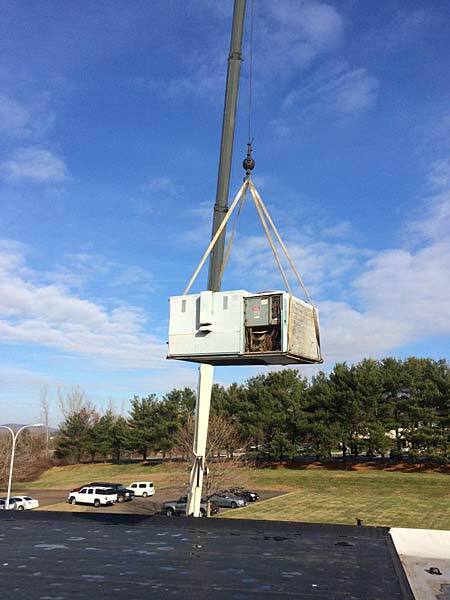 We also installed a new energy efficient air conditioner unit and a new energy efficient 7500 CFM air make-up unit. Both of these units qualified for substantial energy rebates from CMEEC (Connecticut Municipal Electric Energy Cooperative). As you can see from the picture below, we needed a crane of over 150’ in height to span the 75’ of roof distance these units needed to travel. My new Dallas Cowboy’s hard-hat really came in handy on this day!